EIFS is an external finishing system commonly found on buildings in Nashville and Knoxville, Tennessee. 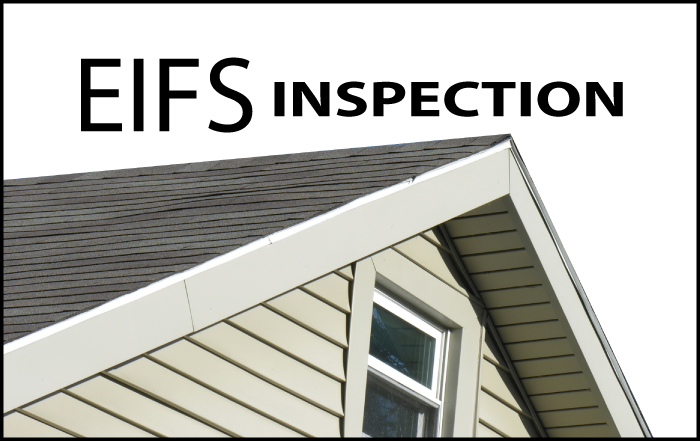 Special training, certification, and equipment are all needed to inspect this type of material properly, and the home inspectors at 1st Choice Home Inspections are both qualified and experienced to perform an EIFS home inspection. EIFS was developed in Europe after World War II as an exterior insulation system, primarily for homes with masonry walls. Masonry walls are fine for strength and durability, but masonry doesn’t provide space for insulation like a traditional home built in America. Adding insulation to the inside of the house was not practical, so a process was invented to add insulation to the outside of the house. EIFS was born. In 1969, EIFS was introduced to American homeowners through a product named DRYVIT, an extremely water resistant material. Before long, this product resembling stucco could be found in more than 30 states. What are the Problems with EIFS? In a relatively short period, several manufacturers began producing various versions of EIFS materials for residential and commercial installations. Due to the high demand, sometimes inexperienced or under-trained installers made what would become costly mistakes for the buildings’ owners. Failures were soon found in some installations at roof rakes, chimneys, floor lines, around windows, doors, and protrusions. Although the material itself is water resistant, sometimes moisture is able to get behind the siding and it cannot get out. This can lead to mold and wood rot between the exterior and interior walls. These conditions are also perfect for subterranean termites. Any type of exterior siding is susceptible to these problems; however, because of the superior nature of EIFS’ water resistance, the problems are intensified. Once water gets in, it cannot get out. The only way to know if you have damage is to do a water analysis. The problems with EIFS are widespread. One environmental inspection company inspected more than 100 homes over a ten-month period and all but a handful had damage to some degree. Most, if the EIFS was installed properly, could be corrected with minor repairs. However, some of the homes needed repairs costing as much as $60,000 on a $500,000 home. 1st Choice Home Inspections can help you protect the investment you made in your home by identifying current or potentially serious problems. Our home inspectors have the training, experience, and equipment to inspect your home for the type of damage EIFS can have. If you have EIFS material on your home, please give us a call and have it inspected. Peace of mind costs so little compared to what the repairs may cost if you let damage go undetected. For more information about EIFS, please visit EIMA.